Rich and density cheese cake and pumpkin cheese cake! yummy! 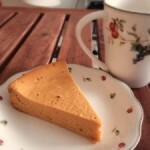 Posted in Sweets	| Tagged cheese cake, Japanese cooking, Japanese cuisine, pumpkin	| Leave a comment on Rich and density cheese cake and pumpkin cheese cake! yummy!